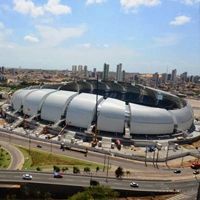 Brazilian president Dilma Rousseff and FIFA secretary general Jerome Valcke were key guests yesterday, when an official delegation of officials arrived at Arena das Dunas yesterday. The late afternoon visit was nicknamed the official opening of the stadium. „I'm delighted with the stadium's beauty. It's also delightful that it was delivered 3% below projected budget and in line with sustainability”, said Rousseff to the press after her visit. However, this symbolic opening was hardly a real one. As politicians were wandering around, workers were still doing their best to properly prepare the stadium for its actual opening this Sunday, when first game is to be played. As the guests left foil was removed from most seats and work on furnishings and lighting system continued. One element that hasn't even been started so far are the upper end sections, which will together hold over 10,000 people during the 2014 World Cup. Current capacity is much too small for group games, at 31,375, so the temporary decks need to be done soon. Not only the unfinished works undermined the image of yesterday's visit. Outside the stadium a couple hundred people protested against the local governor and Brazilian president, blaming them for unnecessary spendings for the FIFA event and negligence of community needs.